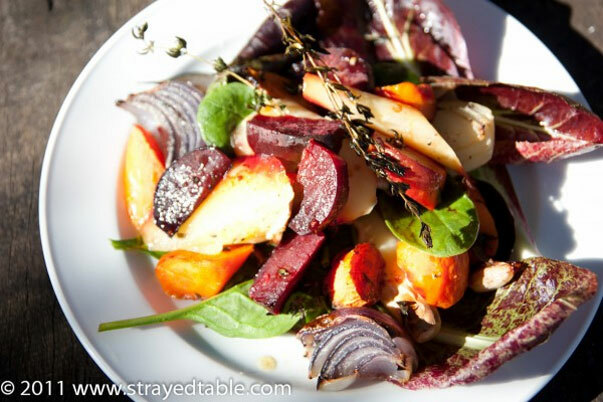 An easy salad that will warm the bones on a cold winter day. Place ¾ of the bunch of thyme, stalk and all on the bottom of a large backing dish, drizzle with a little olive oil. Cut the vegetables into similar sized pieces and place into the baking dish. Separate the garlic and sprinkle over the top of the vegetables. Drizzle again with olive oil, and season generously with salt and pepper. With the remaining thyme, take the leaves off the stalk and sprinkle over the top of the vegetables. Bake for 45min, checking half way through to give them a stir. Once vegetables are cooked, place the radicchio and spinach in a large bowl, add the roasted vegetables and any oil remaining in the dish and discard the thyme stalks. Give the leaves and vegetables a light toss. Serves four as a salad or six as a side to a main meal. Add a few chili flakes before baking to give a little heat to the dish.